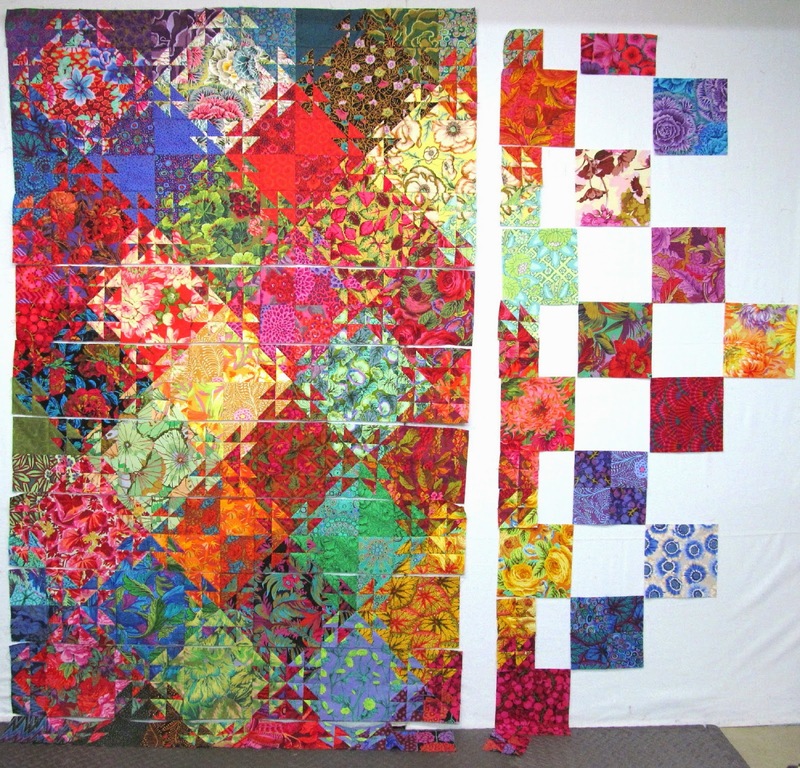 Most of the progress on this quilt has been the decisions of which fabric will appear next and in what order. I think I have only sewn a few triangles since I showed it last time. There will be one more row of squares beyond that yellow/orange print. This photo will be my blueprint for putting it back up on the wall. It needs to come down while the art quilters are here tomorrow. Love I really enjoy seeing your progress. I'm just fascinated watching this quilt grow. You are doing such a great job on this one, Wanda. I love seeing the progress. This one just gets more beautiful with each new decision and row that you add. Wow! It is breathtaking. This is going to be a stunning quilt, I am waiting for it to all come together. I agree, it shimmers! That is the perfect word. I just can't believe the refractive qualities of this quilt! You have the most amazing eye for color placement. I know I've probably said this about other quilts before but, honestly, this one might just have to stay my favorite! 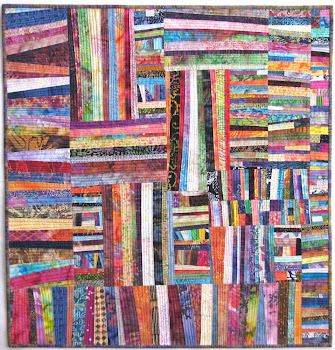 Glad to see you out enjoying the sun have a lot of fun with your art quilters! 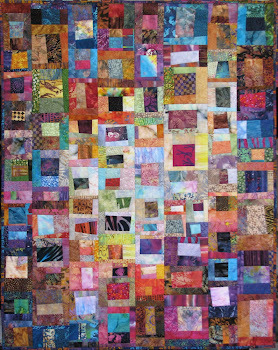 So good to watch your progress with this beautiful quilt, I just love your colours. Awesomeness! I think using the red and blue fabrics which read as solids way over to the left is very gutsy and looks great and a bit modern! This is looking great! I especially like the balance/spacing of the blues. Do you roll up your design wall when you take it down? Or, do you have to reassemble the whole thing? I have never done anything this elaborate, but I know how hard it is to get it all back the way it was. Even with a photo I can hardly do it exactly right. Good luck. This is so beautiful.